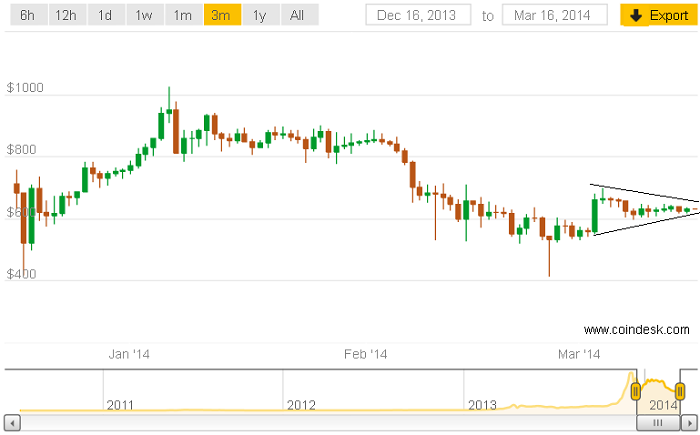 Bitcoin prices have found support above $600 in the weeks following the jarring news of Mt. Gox’s closure and purported loss or theft of nearly all customer funds. 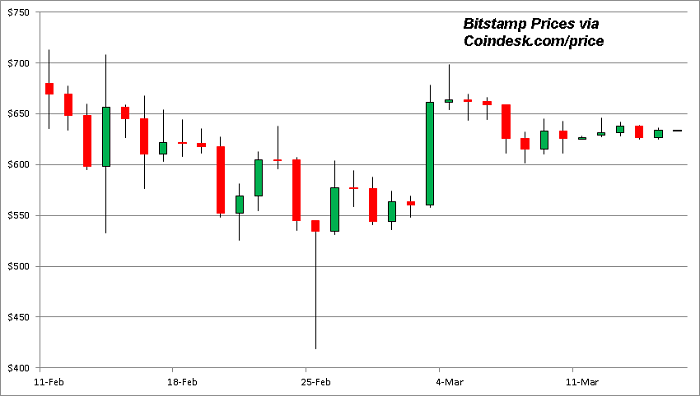 Prices ticked higher just short of a new high for the month Saturday at $646.49 on the Bitstamp exchange, ending the week in an even narrower band of roughly $35 between $615 and $650 versus the prior week’s slightly wider range of ~$605 to $652. Rebounding from a low of $401.99 at Bitstamp to $609 in the two days following the Mt. 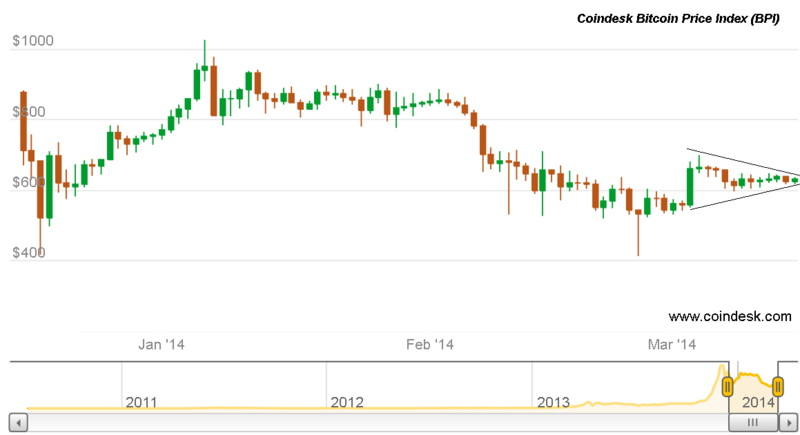 Gox news-related sell-off, prices had a further run-up into the week beginning March, reaching less than a dollar short of $700. 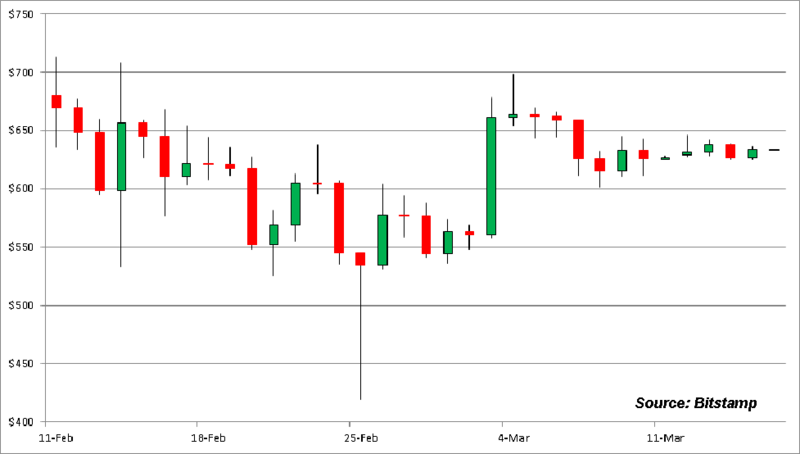 Since then, prices consolidated again over the next two weeks to mid-March, but remaining above $600. While this narrowing wedge pattern is potentially bearish short-term, the months of April and May heading into summer have in the past seen large run-ups in price, so it may be too soon to call for further subdued volatility in price more typical of summer months. Behind the scenes of Mt. Gox and the bitcoin speculators, there are huge strides taking place in mainstream bitcoin adoption which could place a floor under the bitcoin price and lead to gains in price when demand for this means of payment picks up in the fall. While the media feeding frenzy on Mt. Gox was full of negative coverage for bitcoin, there is also the saying that all press is good press. And as days passed, the r/bitcoin forum on reddit grew full of dozens of new major retailer or service providers announcing their acceptance of bitcoin, displacing almost entirely the gloom-and-doom headlines that had accompanied the Mt. Gox debacle. Patrick Byrne, CEO of Overstock.com, e-mailed 40 million of his “closest friends” about his thoughts on bitcoin and his decision to accept it—according to Wired, it had a lot to do, apparently, with his dealings with Wall Street. Joining in his success are many other retailers online and off, including electronics retailer TigerDirect, which achieved $1 million in bitcoin-based sales by March 13, just two months after beginning to accept the digital currency. Wall Street is not uniformly against digital currency, however, as Coindesk reports New York is preparing to allow bitcoin exchanges to open there under new regulations. And they’re going far beyond just acknowledging the mere existence of bitcoin, and then dismissing it entirely as Warren Buffett had recently, politely calling it a “mirage”. Yet the venerable Wall Street firm Goldman Sachs has just released a twenty-five page report on bitcoin, which if you click on the link appears to be very real. In support of that notion, the marketplace for bitcoin in the economic and business worlds is steadily making gains while prices have quietly consolidated above $600. However, if the albeit short history of bitcoin is any guide, higher demand for the digital currency may translate into future price gains.